The first play from writer James Phillips which debuted in 2006, The Rubenstein Kiss explores the story of Julius and Ethel Rosenberg who, in 1953, were executed for allegedly sharing atomic secrets with the Soviet Union. It’s a story that became emblematic of Cold War America and McCarthyism. 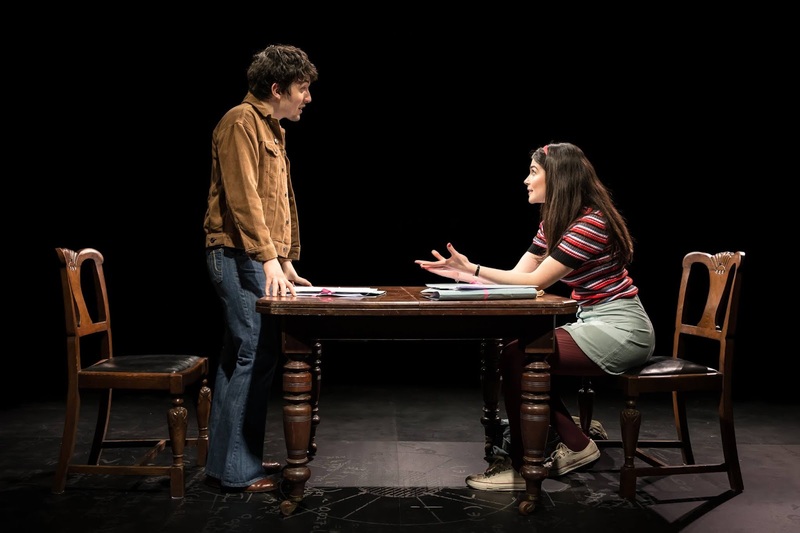 With a few name changes (Rosenberg to Rubenstein) Phillips creates a narrative of political and generational divides inspired by this story, directed by Joe Harmston in this revival at the Southwark Playhouse. 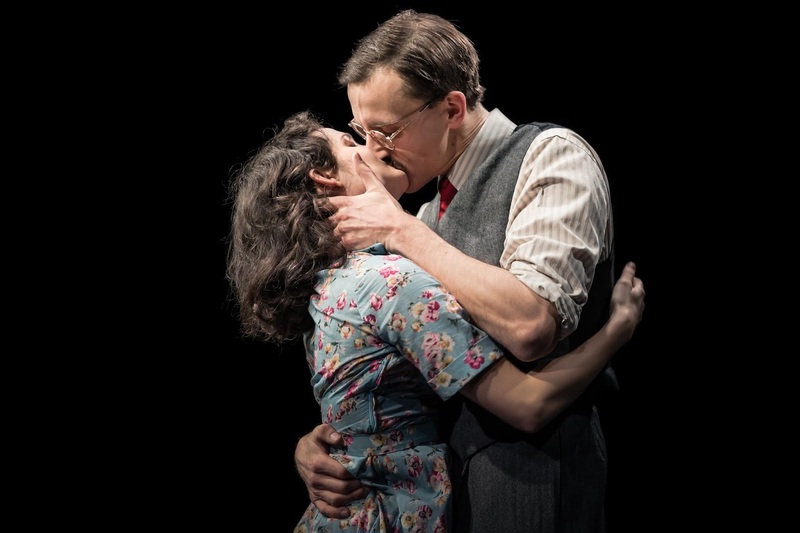 On top of that, though, The Rubenstein Kiss is a love letter to Arthur Miller. Phillips’ script is littered with not so subtle references: most blatantly to Marilyn Monroe and Clark Gable’s film The Misfits that Miller wrote, and to his play The Crucible. These aren’t even nods, but whole monologues devoted to drawing parallels. In addition, there’s the running thread of a sung aria from Puccini’s Madame Butterfly, that crowbars in themes of sacrifice and purity further explained through monologue. It lends the play a clunky feel, as if following in the footsteps of others rather than creating an identity of its own. The thematic parallels are warranted, however. The story of the Rubensteins is one of sacrifice and martyrdom, choosing to profess their innocence in spite of evidence held against them, knowing the consequence would be death. Equally, we witness evidence against them from their own family. The politics are a little murky, but there are plenty of shades of grey here that are ripe for drama, Phillips ultimately allowing the audience to side with or against the couple through a lens of governmental paranoia. 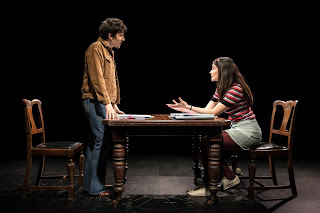 His play is structured with alternating timelines: the Rubenstein’s in the 50s and two young people in the 70s who, predictably, have a personal link to the case. Instead of explaining the facts (and therefore relying a little too heavily on prior knowledge), Philips focuses on a more intimate portrait of a family pushed to breaking point. The second act does eventually tie together the threads, but it’s a long and laboured slog to get there. The performances are accomplished. 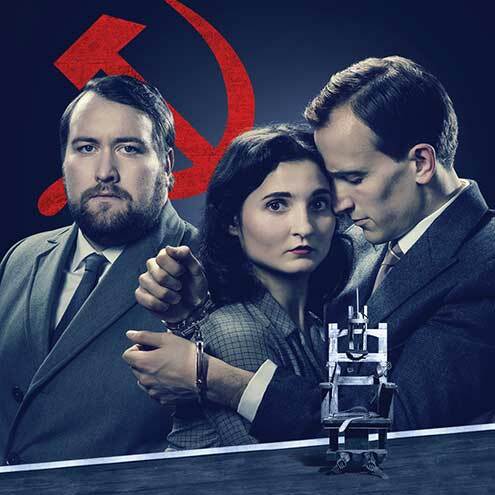 In particular, Ruby Bentall brings inner-strength to Esther Rubenstein, proving the character to be the more courageous of the central couple. Elsewhere Sean Rigby brings some much needed humour as David Girshfeld, and Dario Coates and Katie Eldred have great chemistry in the 70s storyline. Sean Cavanagh’s design is sparse and simple, the stage book-ended by flat pillars of New York scaffolding and the traverse staging literally putting the audience on opposing sides. Harmston’s intention to draw a parallel with our current political climate is intriguing if not altogether clear. Watch: The Rubenstein Kiss runs at the Southwark Playhouse until 13th April.